THIS FILTER SHIPS FREE THRU JANUARY 31ST! High Efficiency Filter Media for Aprilaire Space-Gard 2200 and 2250 (2-Pack). 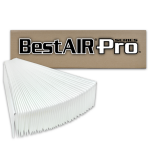 These expandable accordian-style replacement filters are made to fit the Aprilaire Space Gard Model 2200 and 2250 Air Cleaner. MERV 11 rated. They are non-OEM filters. 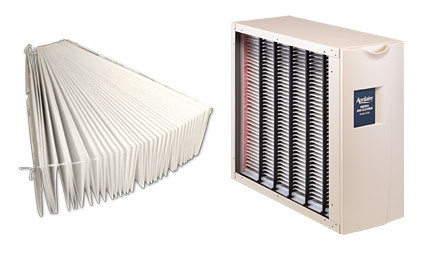 The filters ship like a collapsed accordian and are expanded into a plastic frame within the air cleaner cabinet. The filter is snapped into the plastic frame and held in place with existing your pleat spacers (NOT INCLUDED). Assembly instructions are printed on the product carton. The air cleaner media in the Space Gard Model 2200 can last from 6 months up to 2 years. If installed on a 5-ton system, in the presence of high concentration of particulate, or if the furnace fan is on continuously, it may be necessary to change the media more frequently. In any application, the life of the media is dependant upon the total volume of air being moved through it as well as the amount of particulate it is filtering.